Monday: Occasional downpours in humid air, especially through midday. Highs around 80. Overnight Monday Night: Areas of fog, muggy. Lows around 70. Tuesday: Continued humid, chance afternoon shower inland. Highs in the lower 80s. 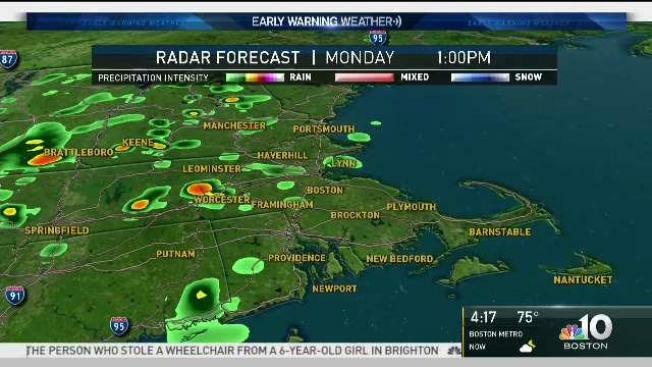 TODAY: Tropical pattern, humidity fueling showers. TOMORROW: Skies might clear across New England. LOOKING AHEAD: Thunderstorm chances near the coast on Thursday and Friday. This tropical pattern will continue for the next week or more. Although the downpours underperformed Sunday, additional downpours will continue throughout the week. High humidity is fuelling the rain and temperatures will be climbing over the next couple of days. Temperatures will reach the low 80s during the afternoon with downpours possible at any time. By Tuesday, the greatest concentration of wet weather will be focused across western New England and upstate New York. Skies may brighten across eastern New England during the day and it could be a beach day if we are lucky. Wednesday, that area of wet weather may shift east a bit. It still appears the coast will be mainly dry. Shower and thunderstorm chances will increase for the coast by Thursday and Friday. Temperatures will drop in the high 60s and low 70s at night and climb into the low to mid-80s during the day. At this point, we are hopeful that we will get a break from the rain for the weekend. Sunday, at this point, could be mainly dry with less humidity. Unfortunately, if you’re NOT a fan of this Florida-like airmass, it looks like it will return the following week. Stay tuned!